If I were asked, “What is the first major cause of most illness?”, I would have to say incomplete digestion. If your food does not break down through the enzymes provided by fresh and raw food in your body, then putrefaction (rotting and decay) will take place. The result? Your body absorbs its own toxic waste before it can be eliminated. Have you ever tried doing two things at once? I know I have and still do, and if you are anything like me, these tasks are usually rushed and incomplete. The same applies to your digestive process. If you combine the wrong foods together in a single meal, your body is required to process incompatible food substances at the same time. This results in “incomplete digestion”, discomfort, and putrefaction. Eating your meals as if they were a smorgasbord can only lead to disaster. Food breaks down in the body with the aid of enzymes or bacteria. Enzyme breakdown is the natural course, while bacterial breakdown is quite destructive. Bacterial breakdown creates toxic gases which manifest in the body as bloating, burping, flatulence, candida, fatigue, headaches, constipation, diarrhea, low back pain, and so on. Your digestive tract will either be your highway to health, or your highway to pain and suffering. You choose the road you want to take.We have been educated via media advertising to compromise our health for the heavenly tastes in the mouth with no concern for the following thirty feet of discomfort and/or pain that follows in our intestinal tract. 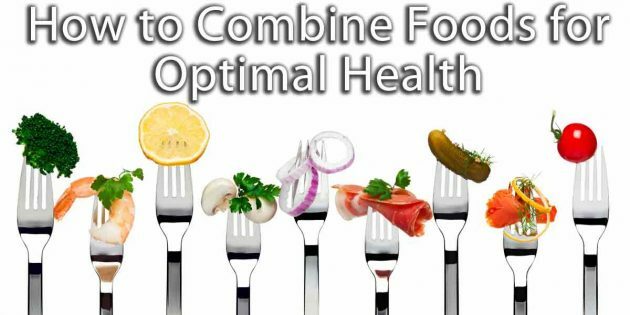 Let’s take a look at the concept of logical eating known as Food Combining. THE REASON FOR PROPER FOOD COMBINING? To make digestion easier and more efficient! If you are going to eat more than one food at a meal, you can greatly improve digestion (and avoid indigestion) by eating foods that are compatible and require the same gastric juices for digestion. Proper combining leads to good digestion and to better health. * These substances are not recommended but included for clarity. The carbohydrates are the starches and sugars. 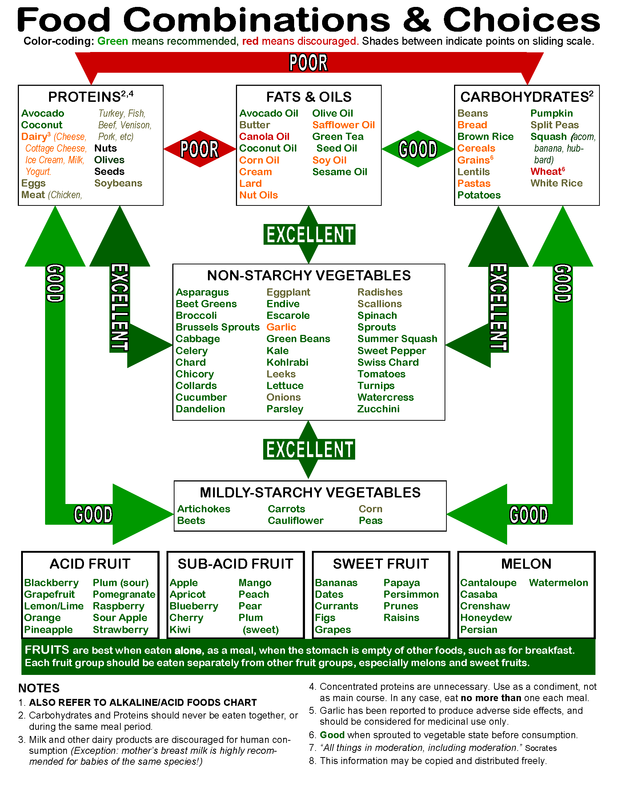 These we break up into three distinct classifications: Starches, Sugars, and Sweet Fruits . . . all require an ALKALINE digestive environment. * These foods are not recommended. ** Coconuts are a starch/protein combination and also a saturated fat. This combination may neutralize your enzymes causing your food to putrefy. Remember the pizza? How it made you feel? Especially when you were tired? Two concentrated proteins of different character and composition (such as nuts and cheese) should not be combined. Gastric acidity, type, strength, and timing of secretions for various proteins is not uniform. Since concentrated protein is more difficult to digest than other food elements, incompatible combinations of two different concentrated proteins should be avoided. Our need for concentrated fat is small and most protein foods already contain a good deal of fat. Fat has an inhibiting effect on digestive secretions and lessens the amount and activity of pepsin and hydrochloric acid necessary for the digestion of protein. Fat may lower the entire digestive tone more than 50%. Fats inhibit the secretion of gastric juice. Except with avocado, fats used with starch delay the passage of the starch from the stomach into the intestine. When fats such as avocados or nuts are eaten with raw green vegetables, their inhibiting effect on gastric secretion is counteracted and digestion proceeds normally. Citrus, tomatoes, pineapple, strawberries, and other acid fruits should not be eaten with nuts, cheese, eggs or meat. If you are ill, avoid acid fruits especially in juice form – but lemons and limes are always a great addition due to their enzyme content. The sugars in sweet fruit should be free to leave the stomach within twenty minutes, and are apt to ferment if digestion is delayed by mixing with other foods. Sugar-starch combinations cause additional problems. When sugar is taken, the mouth quickly fills with saliva, but no ptyalin is present. Ptyalin is essential for starch digestion. If starch is disguised by sugar, honey, molasses, or sweet fruit, digestion is impaired. Fermentation is inevitable if sugars of any kind are delayed in the stomach by the digestion of starch, protein, or acid fruit. Sugar also has a marked inhibiting effect on the flow of gastric juices. This rule is more important as a means of avoiding overeating starches than avoiding a bad combination. Slightly starchy vegetables may be combined with more starchy vegetables such as carrots and potatoes, but not with combination foods such as grains and legumes. This combination is best made with less sweet subacid fruits. Never use acid fruits with sweet fruits. Tomatoes should not be combined with subacid fruit nor with any other kind of fruit. They are best combined with a salad meal at which no starches are served. It is best to use the sweeter varieties of subacid fruits when making this combination. For people with poor digestion, bananas are best eaten alone. For others, bananas combine fairly well with dates, raisins, grapes, and other sweet fruit, and with green leafy vegetables such as lettuce and celery. Dried sweet fruits should be used sparingly, because the sugar concentration is naturally greater. It is best to have these fruits at a fruit meal combined with a salad of lettuce and celery. These uncooked vegetables with a fruit meal may even enhance digestion of the fruit. Non starchy vegetables may be combined with proteins or starch. The green leafy vegetables combine very well with most other foods, and should form the major part of one’s daily diet. Through the week, use as wide a variety of vegetables as possible. Lettuce and other green and non-starchy vegetables leave the stomach with little change. They pass through the stomach rapidly unless delayed by oily dressing or foods that require a more thorough gastric digestion. Many people who have complained that melons did not agree with them have no trouble when eating only melons at a meal. Melons are more than 90% liquid and leave the stomach quickly if not delayed and fermented by combining with other foods. Avoid over-ripe fruit, this may cause digestive disturbances. The best way to eat grains is as sprouts. When grains are sprouted, they come alive with enzymes and oxygen. They become a pre-digested food. Other seeds and legumes may be sprouted as well. You should drink alkaline water throughout the day. Do not allow your thirst to build up. Do not allow dehydration to occur. Do not drink a large amount at one time. It is better to have a smaller but continual flow of water for proper assimilation and detoxification. Don’t dilute the natural enzymes in your body by drinking with meals. Water is a food, make it the best quality you can. Avoid distilled and chlorinated for health sake. Sources & References: For more information we recommend the following books: “Food Combining Made Easy” ( in CAN) and “Superior Nutrition” ( in CAN) by Herbert Shelton D.P., N.D., D.N.T, D.N.Sc. Excerpts from the above have been taken from a document published by The Canadian Natural Health Association Founded on Natural Hygiene, Toronto Chapter.